Join the Institute for Policy Innovation for a complimentary screening of "Invalidated The Shredding of the U.S. Patent System." When father of eight Josh Malone invents a genius way to fill 100 water balloons in 60 seconds, his invention "Bunch O Balloons" becomes an overnight success on Kickstarter and an international viral hit! Scrambling to get his idea to market and bring financial security to his family, he applies for a US Patent. But, his plans of success are blindsided when his genius idea is stolen by a big company before he can make his first dime! Thrust into a battle to save his invention he uncovers the shocking truth that our patent system is weakening, property rights are at risk and American innovation is dying. Learn how big tech companies, China and our own Patent office are robbing American inventors of their ideas, their labor and their financial investments. Watch the official trailer here. 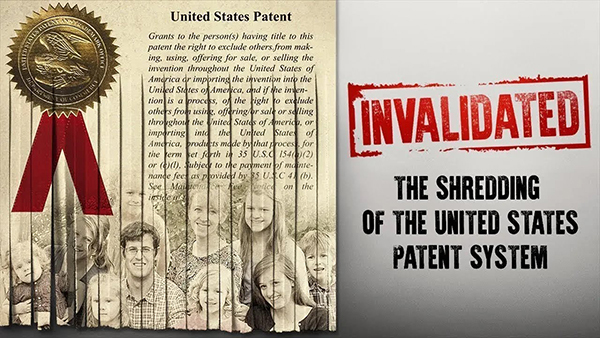 The film features interviews with experts like former Attorney General Ed Meese, Inventor and Congressional Representative Thomas Massie, Antonin Scalia Law Professor and IP expert Adam Mossoff provide shocking information about the state of the weakening US Patent system. Other inventors share their stories of theft, patent invalidation, and difficulty finding investors for their patented innovations. IPI's Tom Giovanetti, Ken Blackwell, Leonard Leo, Dr. Matthew Spalding, and conservative leader Dan Schneider all provide valuable insights into how the current system is harming Americans and the American innovation economy. Screening begins at 6:00 pm, followed by a panel discussion at 7:15 pm. Light refreshments will be served.